"Psalm", "Psalmody", and "Tehilim" redirect here. For other uses, see Psalm (disambiguation), Psalmody (grape), and Tehilim (film). The Book of Psalms (/sɑːmz/ or /sɔː(l)mz/ SAW(L)MZ; Hebrew: תְּהִלִּים, Tehillim, "praises"), commonly referred to simply as Psalms or "the Psalms", is the first book of the Ketuvim ("Writings"), the third section of the Hebrew Bible, and thus a book of the Christian Old Testament. The title is derived from the Greek translation, ψαλμοί, psalmoi, meaning "instrumental music" and, by extension, "the words accompanying the music". The book is an anthology of individual psalms, with 150 in the Jewish and Western Christian tradition and more in the Eastern Christian churches. Many are linked to the name of David, but his authorship is not accepted by modern scholars. For the Orthodox Christian division into twenty kathismata, see below. Many psalms (116 of the 150) have individual superscriptions (titles), ranging from lengthy comments to a single word. Over a third appear to be musical directions, addressed to the "leader" or "choirmaster", including such statements as "with stringed instruments" and "according to lilies". 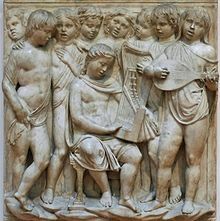 Others appear to be references to types of musical composition, such as "A psalm" and "Song", or directions regarding the occasion for using the psalm ("On the dedication of the temple", "For the memorial offering", etc.). Many carry the names of individuals, the most common (73 psalms—75 if including the two Psalms attributed by the New Testament to David) being of David, and thirteen of these relate explicitly to incidents in the king's life. Others named include Asaph (12), the sons of Korah (11), Solomon (2), Moses (1), Ethan the Ezrahite (1), and Heman the Ezrahite (1). 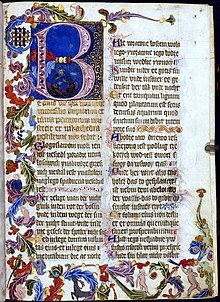 The LXX, the Peshitta (the Syriac Vulgate), and the Latin Vulgate each associate several Psalms (such as 111 and 145) with Haggai and Zechariah. The LXX also attributes several Psalms (like 112 and 135) to Ezekiel and to Jeremiah. The variance between Massorah and Septuagint texts in this numeration is likely enough due to a gradual neglect of the original poetic form of the Psalms; such neglect was occasioned by liturgical uses and carelessness of copyists. It is generally admitted that Pss. 9 and 10 were originally a single acrostic poem; they have been wrongly separated by Massorah, rightly united by the Septuagint and Vulgate. Pss. 42 and 43 are shown by identity of subject (yearning for the house of Yahweh), of metrical structure and of refrain (cf. Heb. Ps. 42:6, 12; 43:5), to be three strophes of one and the same poem. The Hebrew text is correct in counting as one Ps. 146 and Ps. 147. Later liturgical usage would seem to have split up these and several other psalms. Zenner combines into what he deems were the original choral odes: Pss. 1, 2, 3, 4; 6 + 13; 9 + 10; 19, 20, 21; 56 + 57; 69 + 70; 114 + 115; 148, 149, 150. A choral ode would seem to have been the original form of Pss. 14 and 70. The two strophes and the epode are Ps. 14; the two antistrophes are Ps. 70. It is noteworthy that, on the breaking up of the original ode, each portion crept twice into the Psalter: Ps. 14 = 53, Ps. 70 = 40:14–18. Other such duplicated portions of psalms are Ps. 108:2–6 = Ps. 57:8–12; Ps. 108:7–14 = Ps. 60:7–14; Ps. 71:1–3 = Ps. 31:2–4. This loss of the original form of some of the psalms is allowed by the Biblical Commission (1 May 1910) to have been due to liturgical practices, neglect by copyists, or other causes. The Septuagint, present in Eastern Orthodox churches, includes a Psalm 151; a Hebrew version of this was found in the Psalms Scroll of the Dead Sea Scrolls. Some versions of the Peshitta (the Bible used in Syriac churches in the Middle East) include Psalms 152–155. There are also the Psalms of Solomon, which are a further 18 psalms of Jewish origin, likely originally written in Hebrew, but surviving only in Greek and Syriac translation. These and other indications suggest that the current Western Christian and Jewish collection of 150 psalms were selected from a wider set. Hymns, songs of praise for God's work in creation or history. They typically open with a call to praise, describe the motivation for praise, and conclude with a repetition of the call. Two sub-categories are "enthronement psalms", celebrating the enthronement of Yahweh as king, and Zion psalms, glorifying Mount Zion, God's dwelling-place in Jerusalem. Gunkel also described a special subset of "eschatological hymns" which includes themes of future restoration (Psalm 126) or of judgment (Psalm 82). In general, the individual and communal subtypes can be distinguished by the use of the singular "I" or the plural "we". However, the "I" could also be characterising an individual's personal experience that was reflective of the entire community. Royal psalms, dealing with such matters as the king's coronation, marriage and battles. None of them mentions any specific king by name, and their origin and use remain obscure; several psalms, especially Ps. 93–99, concern the kingship of God, and might relate to an annual ceremony in which Yahweh would be ritually reinstated as king. Individual laments lamenting the fate of the particular individual who utters them. They are by far the most common type of psalm. They typically open with an invocation of God, followed by the lament itself and pleas for help, and often ending with an expression of confidence. A subset is the psalm of confidence, in which the psalmist expresses confidence that God will deliver him from evils and enemies. Individual thanksgiving psalms, the opposite of individual laments, in which the psalmist thanks God for deliverance from personal distress. a group of mixed psalms which could not be assigned to any category. 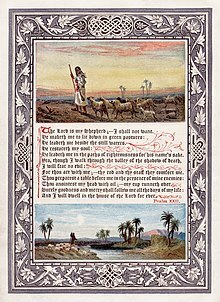 The composition of the psalms spans at least five centuries, from Psalm 29, possibly an Israelite adaptation of an entire Canaanite hymn to Baal, to others clearly from the post-Exilic period (not earlier than the fifth century B.C.) The majority originated in the southern kingdom of Judah and were associated with the Temple in Jerusalem, where they probably functioned as libretto during the Temple worship. Exactly how they did this is unclear, although there are indications in some of them: "Bind the festal procession with branches, up to the horns of the altar," suggests a connection with sacrifices, and "Let my prayer be counted as incense" suggests a connection with the offering of incense. "The LORD is my light and my salvation; whom shall I fear? The LORD is the stronghold of my life; of whom shall I be afraid?" (Psalm 27:1). "And he led them in a cloud by day/ and all the night by a fiery light" (Psalm 78:14). "My mouth is filled with your praise/ all the day with your lauding" (Psalm 71:8). Many scholars believe the individual Psalms were redacted into a single collection in Second-Temple times. 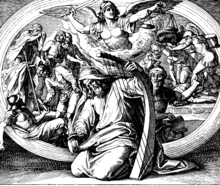 It had long been recognized that the collection bore the imprint of an underlying message or metanarrative, but that this message remained concealed, as Augustine of Hippo said, "The sequence of the Psalms seems to me to contain the secret of a mighty mystery, but its meaning has not been revealed to me." (Enarr. on Ps. 150.1) Others pointed out the presence of concatenation, that is, adjacent Psalms sharing similar words and themes. In time, this approach developed into recognizing overarching themes shared by whole groups of psalms. In 1985, Gerald H. Wilson's The Editing of the Hebrew Psalter proposed – by parallel with other ancient eastern hymn collections – that psalms at the beginning and end (or "seams") of the five books of Psalms have thematic significance, corresponding in particular with the placement of the royal psalms. He pointed out that there was a progression of ideas, from adversity, through the crux of the collection in the apparent failure of the covenant in Psalm 89, leading to a concert of praise at the end. He concluded that the collection was redacted to be a retrospective of the failure of the Davidic covenant, exhorting Israel to trust in God alone in a non-messianic future. Walter Brueggemann suggested that the underlying editorial purpose was oriented rather towards wisdom or sapiential concerns, addressing the issues of how to live the life of faith. Psalm 1 calls the reader to a life of obedience; Psalm 73 (Brueggemann's crux psalm) faces the crisis when divine faithfulness is in doubt; Psalm 150 represents faith's triumph, when God is praised not for his rewards, but for his being. In 1997, David. C. Mitchell's The Message of the Psalter took a quite different line. Building on the work of Wilson and others, Mitchell proposed that the Psalter embodies an eschatological timetable like that of Zechariah 9–14. This programme includes the gathering of exiled Israel by a bridegroom-king; his establishment of a kingdom; his violent death; Israel scattered in the wilderness, regathered and again imperilled, then rescued by a king from the heavens, who establishes his kingdom from Zion, brings peace and prosperity to the earth and receives the homage of the nations. These three views—Wilson's non-messianic retrospective of the Davidic covenant, Brueggemann's sapiential instruction, and Mitchell's eschatologico-messianic programme—all have their followers, although the sapiential agenda has been somewhat eclipsed by the other two. Shortly before his untimely death in 2005, Wilson modified his position to allow for the existence of messianic prophecy within the Psalms' redactional agenda. Mitchell's position remains largely unchanged, although he now sees the issue as identifying when the historical beginning of the Psalms turns to eschatology. The Psalms were written not merely as poems, but as songs for singing. More than a third of the psalms are addressed to the Director of Music. Some psalms exhort the worshipper to sing (e.g. Pss. 33:1-3; 92:1-3; 96:1-3; 98:1; 101:1; 150). Some headings denote the musical instruments on which the psalm should be played (Pss. 4, 5, 6, 8, 67). Some refer to singing at the sheminit or octave (Pss. 6, 12). And others preserve the name for ancient eastern modes, like mut la-ben (Death of the son; Ps. 9), ayelet ha-shachar (hind of the dawn; Ps. 22); shoshanim (Lilies; Ps. 45); or alamoth (Maidens? ; Ps. 46). Despite the frequently heard view that their ancient music is lost, the means to reconstruct it are still extant. Fragments of temple psalmody are preserved in ancient church and synagogue chant, particularly in the tonus peregrinus melody to Psalm 114. Cantillation signs, to record the melody sung, were in use since ancient times; evidence of them can be found in the manuscripts of the oldest extant copies of Psalms in the Dead Sea Scrolls and are even more extensive in the Masoretic text, which dates to the Early Middle Ages and whose Tiberian scribes claimed to be basing their work on temple-period signs. (See Moshe ben Asher's 'Song of the Vine' colophon to the Codex Cairensis). Several attempts have been made to decode the Masoretic cantillation, but the most successful is that of Suzanne Haïk-Vantoura (1928–2000) in the last quarter of the 20th century. Although some have dismissed Haïk-Vantoura's system, Mitchell has repeatedly defended it, showing that, when applied to the Masoretic cantillation of Psalm 114, it produces a melody recognizable as the tonus peregrinus of church and synagogue. Mitchell includes musical transcriptions of the temple psalmody of Psalms 120–134 in his commentary on the Songs of Ascents. Regardless of academic research, Sephardic Jews have retained a tradition in the Masoretic cantillation. Most individual psalms involve the praise of God—for his power and beneficence, for his creation of the world, and for his past acts of deliverance for Israel. The psalms envision a world in which everyone and everything will praise God, and God in turn will hear their prayers and respond. Worst of all is when God "hides his face" and refuses to respond, because this puts in question the efficacy of prayer which is the underlying assumption of the Book of Psalms. 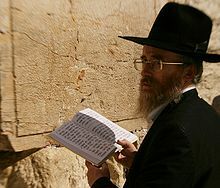 A Jewish man reads Psalm 119 at the Western Wall. Individual psalms were originally hymns, to be used on various occasions and at various sacred sites; later, some were anthologised, and might have been understood within the various anthologies (e.g., ps. 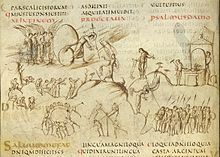 123 as one of the Psalms of Ascent); finally, individual psalms might be understood within the Psalter as a whole, either narrating the life of David or providing instruction like the Torah. In later Jewish and Christian tradition, the psalms have come to be used as prayers, either individual or communal, as traditional expressions of religious feeling. Some bear the Hebrew description shir (שיר; Greek: ᾠδή, ōdḗ, 'song'). Thirteen have this description. It means the flow of speech, as it were, in a straight line or in a regular strain. This description includes secular as well as sacred song. Fifty-eight Psalms bear the description mizmor (מזמור; ψαλμός), a lyric ode, or a song set to music; a sacred song accompanied with a musical instrument. Psalm 145, and many others, has the designation tehillah (תהילה; ὕμνος), meaning a song of praise; a song the prominent thought of which is the praise of God. Thirteen psalms are described as maskil ('wise'): 32, 42, 44, 45, 52–55, 74, 78, 88, 89, and 142. Psalm 41:2, although not in the above list, has the description ashrei maskil. 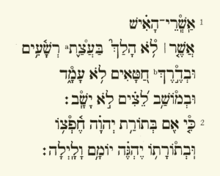 Six Psalms (16, 56–60) have the title michtam (מכתם, 'gold'). Rashi suggests that michtam refers to an item that a person carries with him at all times, hence, these Psalms contain concepts or ideas that are pertinent at every stage and setting throughout life, deemed vital as part of day-to-day spiritual awareness. Psalm 7 (along with Habakkuk ch. 3) bears the title shigayon (שיגיון). 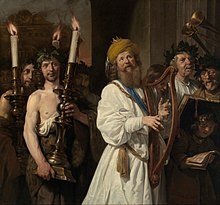 There are three interpretations: (a) According to Rashi and others, this term stems from the root shegaga, meaning "mistake"—David committed some sin and is singing in the form of a prayer to redeem himself from it; (b) shigayon was a type of musical instrument; (c) Ibn Ezra considers the word to mean "longing", as for example in the verse in Proverbs 5:19 tishge tamid. Psalms are used throughout traditional Jewish worship. Many complete Psalms and verses from Psalms appear in the morning services (Shacharit). The pesukei dezimra component incorporates Psalms 30, 100 and 145–150. Psalm 145 (commonly referred to as "Ashrei", which is really the first word of two verses appended to the beginning of the Psalm), is read three times every day: once in shacharit as part of pesukei dezimrah, as mentioned, once, along with Psalm 20, as part of the morning's concluding prayers, and once at the start of the afternoon service. On Festival days and Sabbaths, instead of concluding the morning service, it precedes the Mussaf service. Psalms 95–99, 29, 92, and 93, along with some later readings, comprise the introduction (Kabbalat Shabbat) to the Friday night service. Traditionally, a different "Psalm for the Day"—Shir shel yom—is read after the morning service each day of the week (starting Sunday, Psalms: 24, 48, 82, 94, 81, 93, 92). This is described in the Mishnah (the initial codification of the Jewish oral tradition) in the tractate Tamid. According to the Talmud, these daily Psalms were originally recited on that day of the week by the Levites in the Temple in Jerusalem. From Rosh Chodesh Elul until Hoshanah Rabbah, Psalm 27 is recited twice daily following the morning and evening services. There is a Minhag (custom) to recite Psalm 30 each morning of Chanukkah after Shacharit: some recite this in place of the regular "Psalm for the Day", others recite this additionally. When a Jew dies, a watch is kept over the body and tehillim (Psalms) are recited constantly by sun or candlelight, until the burial service. Historically, this watch would be carried out by the immediate family, usually in shifts, but in contemporary practice this service is provided by an employee of the funeral home or chevra kadisha. Psalm 137, By the rivers of Babylon, there we sat down and wept, the Eastern Orthodox Church uses this hymn during the weeks preceding Great Lent. The work of Bishop Richard Challoner in providing devotional materials in English meant that many of the psalms were familiar to English-speaking Catholics from the eighteenth century onwards. Challoner translated the entirety of the Little Office into English, as well as Sunday Vespers and daily Compline. He also provided other individual Psalms such as 129/130 for prayer in his devotional books. Bishop Challoner is also noted for revising the Douay–Rheims Bible, and the translations he used in his devotional books are taken from this work. 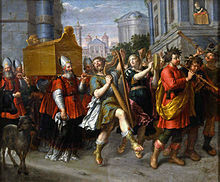 A singing and dancing David leads the Ark of the Covenant, c. 1650. Following the Protestant Reformation, versified translations of many of the Psalms were set as hymns. These were particularly popular in the Calvinist tradition, where in the past they were typically sung to the exclusion of hymns. John Calvin himself made some French translations of the Psalms for church usage, but the completed Genevan Psalter eventually used in church services consisted exclusively of translations by Clément Marot and Théodore de Bèze, on melodies by a number of composers, including Louis Bourgeois and a certain Maistre Pierre. Martin Luther's Ein feste Burg ist unser Gott is based on Psalm 46. Among famous hymn settings of the Psalter were the Scottish Psalter and the paraphrases by Isaac Watts. The first book printed in North America was a collection of Psalm settings, the Bay Psalm Book (1640). In Great Britain, the 16th-century Coverdale psalter still lies at the heart of daily worship in Cathedrals and many parish churches. The new Common Worship service book has a companion psalter in modern English. The version of the psalter in the American Book of Common Prayer prior to the 1979 edition is the Coverdale psalter. The Psalter in the American Book of Common Prayer of 1979 is a new translation, with some attempt to keep the rhythms of the Coverdale psalter. The Psalms are often equated to the Zabur mentioned in the Quran. Zabur (Arabic: زبور‎) is, according to Islam, the holy book of Dawud (David), one of the holy books revealed by God before the Quran, alongside others such as the Tawrat (Torah) of Musa (Moses) and the Injil (Gospel) of Īsā (Jesus). In the Quran, the Zabur is mentioned by name only three times. The Quran itself says nothing about the Zabur specifically, except that it was revealed to David, king of Israel and that in Zabur is written "My servants the righteous, shall inherit the earth". We have sent thee inspiration, as We sent it to Noah and the Messengers after him: we sent inspiration to Ibrahim, Isma'il, Ishaq, Yaqub and the Tribes, to Isa, Ayyub, Yunus, Aaron, and Sulayman, and to Dawood We gave the Psalms. Before this We wrote in the Psalms, after the Message (given to Moses): "My servants the righteous, shall inherit the earth." The last reference is of interest because of the quotation from Psalm 37 verse 29, which says, "The righteous shall inherit the land, and dwell therein for ever," (as translated in the King James Version of the Bible). According to Ahrens (1930) the last reference is quoted from Psalms. He says that the verse in the Quran reads "We have written in the Zabur after the reminder that My righteous servants shall inherit the earth." His conclusion is that this verse represents a close and rare linguistic parallel with the Hebrew Bible and more pointedly, with Psalm 37 ascribed specifically to David (see verses 9, 11, 29 which refer to the meek, the righteous or “those who wait upon the Lord” as they who shall inherit the earth). Verse from Psalm 66 at the Grand Canyon, Arizona. Psalm 126 In convertendo Dominus by Jean-Philippe Rameau (1683–1764). Carl Nielsen set in Tre Motetter three verses from different psalms as motets for unaccompanied chorus, first performed in 1930. There are also multiple contemporary popular artists, including Soul-Junk, Robbie Seay Band, Shane and Shane, Enter the Worship Circle, Sons of Korah, and Jon Foreman (lead singer of the Christian band Switchfoot) who have set multiple psalms to music on various albums. In the musical Godspell, the song "Bless The Lord" is based on Psalm 103, and "On the Willows" is based on Psalm 137. ^ Murphy 1993, p. 626. ^ a b Kselman 2007, p. 775. ^ Clifford 2010, p. 773. ^ Day 2003, pp. 11–12. ^ Claudio Crispim. "Psalm 91 – He who dwells in the secret place of the Most High". Biblical Studies. Archived from the original on 2016-03-04. Retrieved 2015-02-11. ^ C. Westermann, The Living Psalms (trans. J.R. Porter; Edinburgh: T. & T. Clark, 1989; M.E. Tate, Psalms 51–100 (Waco, TX: Word, 1990). ^ G.H. Wilson, The Editing of the Hebrew Psalter (Chico, CA: Scholars Press, 1985). ^ W. Brueggemann, 'Bounded by Obedience and Praise: The Psalms as Canon', JSOT 50:63–92. ^ B.S. Childs, Introduction to the Old Testament as Scripture (Philadelphia: Fortress, 1979) 511–18; J.L. Mays, '"In a Vision": The Portrayal of the Messiah in the Psalms', Ex Auditu 7: 1–8; J. Forbes, Studies on the Book of Psalms (Edinburgh: T. & T. Clark, 1888). ^ D.C. Mitchell, The Message of the Psalter: An Eschatological Programme in the Book of Psalms, JSOT Supplement 252 (Sheffield: Sheffield Academic Press, 1997). ^ G.H. Wilson, 'King, Messiah, and the Reign of God: Revisiting the Royal Psalms and the Shape of the Psalter' in P.W. Flint and P.D. Miller (eds. ), The Book of Psalms: Composition and Reception (Leiden: Brill, 2005). ^ He has expanded his views on some subjects; see '"God Will Redeem My Soul From Sheol": The Psalms of the Sons of Korah', JSOT 30 (2006) 365–84; 'Lord, Remember David: G.H. Wilson and the Message of the Psalter', Vetus Testamentum 56 (2006) 526–48; The Songs of Ascents (Campbell: Newton Mearns, 2015) 211–16; 36–44. ^ Werner, The Sacred Bridge (New York: Columba University Press, 1957) 419, 466. ^ For discussion on the origins and antiquity of the Masoretic cantillation, see D.C. Mitchell, The Songs of Ascents (Campbell: Newton Mearns 2015): 122-137. ^ S. Haïk-Vantoura, La musique de la Bible révélée (Robert Dumas: Paris, 1976); Les 150 Psaumes dans leurs melodies antiques (Paris: Fondation Roi David, 1985). ^ D.C. Mitchell, The Songs of Ascents: Psalms 120 to 134 in the Worship of Jerusalem's temples (Campbell: Newton Mearns 2015); 'Resinging the Temple Psalmody', JSOT 36 (2012) 355–78; 'How Can We Sing the Lord's Song?' in S. Gillingham (ed. ), Jewish and Christian Approaches to the Psalms (Oxford University Press, 2013) 119–133. ^ "Tehillim". www.sephardichazzanut.com. Retrieved 2018-05-22. ^ McKenzie, Steven L. (2000). King David: A Biography. New York: Oxford University Press. pp. 39–40. ISBN 978-0-19-535101-9. ^ DLC (2006-08-27). "Hebrew Language Detective: katom". Balashon. Retrieved 2012-09-19. ^ "ארכיון הדף היומי". Vbm-torah.org. ^ "ספר החינוך - אהרן, הלוי, מברצלונה, מיחס לו; שעוועל, חיים דב, 1906-1982; רוזנס, יהודה בן שמואל, 1657-1727; ברלין, ישעיה בן יהודה, 1725-1799 (page 637 of 814)". Hebrewbooks.org. ^ For the relationship between prayer and psalms—tefillah and tehillah—see S. R. Hirsch, Horeb §620. See also Jewish services § Philosophy of prayer. ^ Tom Meyer. "Saint Sabas and the Psalms" (PDF). Etrfi.org. Retrieved 14 July 2018. ^ "Surat Al Israa". Legacy.quran.com. Retrieved 14 July 2018. ^ "Shadow Of Deth". megadeth.com. Archived from the original on 2014-11-29. Berlin, Adele; Brettler, Marc Zvi (2004). "Psalms". In Berlin, Adele; Brettler, Marc Zvi; Fishbane, Michael A. (eds.). The Jewish Study Bible. Oxford University Press. ISBN 9780195297515. Bullock, C. Hassell (2004). Encountering the Book of Psalms: A Literary and Theological Introduction. Baker Academic. ISBN 9780801027956. Clifford, Richard J. (2010). "Psalms". In Coogan, Michael David; Brettler, Marc Zvi; Newsom, Carol Ann (eds.). The New Oxford Annotated Bible: New Revised Standard Version: with the Apocrypha: an Ecumenical Study Bible. Oxford University Press. ISBN 9780195289558. Day, John (2003). Psalms. Continuum. ISBN 9780567084545. Hayes, John H. (1998). "The Songs of Israel". In McKenzie, Steven L.; Graham, Matt Patrick (eds.). The Hebrew Bible Today: An Introduction to Critical Issues. Westminster John Knox Press. ISBN 9780664256524. Kselman, John S. (2007). "Psalms". In Coogan, Michael David; Brettler, Marc Zvi; Newsom, Carol Ann (eds.). The New Oxford Annotated Bible with the Apocryphal/Deuterocanonical Books. Oxford University Press. ISBN 978-0-19-528880-3. Mazor, Lea (2011). "Book of Psalms". In Berlin, Adele; Grossman, Maxine (eds.). The Oxford Dictionary of the Jewish Religion. Oxford University Press. ISBN 9780199730049. Mitchell, David C. (1997). The Message of the Psalter: An Eschatological Programme in the Book of Psalms. JSOT: Sheffield Academic Press. ISBN 978-1-85075-689-7. Mitchell, David C. (2015). 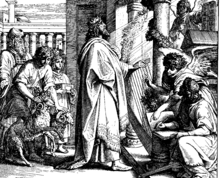 The Songs of Ascents: Psalms 120 to 134 in the Worship of Jerusalem's Temples. Campbell: Newton Mearns. Murphy, Roland E. (1993). "Psalms". In Coogan, Michael D.; Metzger, Bruce (eds.). The Oxford Companion to the Bible. Oxford University Press. ISBN 9780199743919. Prinsloo, Willem S. (2003). "Psalms". In Dunn, James D. G.; Rogerson, John William (eds.). Eerdmans Commentary on the Bible. Eerdmans. ISBN 9780802837110. Zenner, Johannes Konrad (1896). Die Chorgesänge im Buche der Psalmen: ihre Existenz und ihre Form nachgewiesen. Herder. Tehillim Online to read psalms of David in Hebrew or transliterated. reading of Tehillim—Psalms and many explanation. St. Augustine of Hippo (1888). Homelies on Psalms. clerus.org. Translated by Philip Schaff. Archived from the original on Apr 11, 2019. Fordham, David, ed. (October 1986), The Book of Psalms: In the Authorized Version (illuminated ed. ), ISBN 978-0805000467 .